This page will walk through "Remember Me" in spring security example. Remember-me functionality enables a user to keep logged-in. 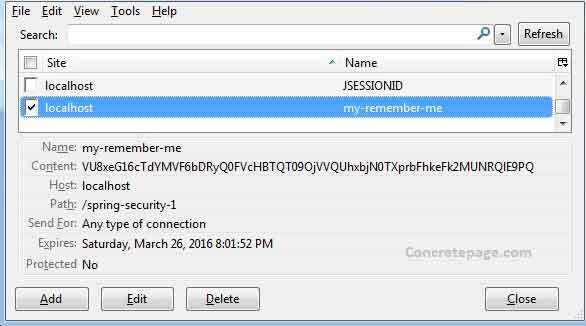 In our application we provide an option, usually checkbox, to the user to select remember-me and if the user checks it then after successful login, spring application sends a remember-me cookie to the browser in addition to session cookie. Once the session cookie is expired, then if user accesses the secure page, it will automatically be logged-in using remember-me cookie. Spring performs remember-me functionality by creating token using authentication details. There are two approach to achieve remember-me functionality, one is simple hash-based token approach and another is persistent token approach. Here on this page we will provide example using both approach with annotation as well as XML configuration. In our example, we are using spring 4 security. CSRF is enabled by default in JavaConfig as well as XML configuration. 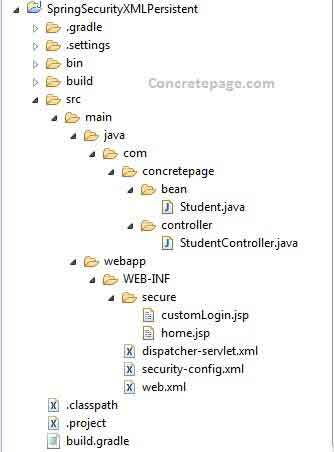 When we use spring form tag in our UI and JavaConfig is annotated with @EnableWebSecurity, we need not to include HTML hidden input field for CSRF parameter, it will be automatically included at run time. Remember-me is a functionality using which a user can be identified between sessions. It means once the user logins in web application with remember-me option, he will be able to access secure application even after session expired. This is also called persistent-login authentication. To achieve it spring sends an additional cookie to the browser and once the session is expired, user is automatically authenticated and is logged in using remember-me cookie. While configuring remember me functionality we can also set the remember me cookie expiry time. To achieve this functionality, spring provides below approaches. Simple hash-based token approach : Hashing strategy is used to create token. The token is created using username, expiration time, password and a key. After successful authentication a cookie using token value is sent to the browser. This approach has security issue and is commonly not recommended. Persistent token approach : In this approach we need to create a table with name persistent_logins where token is saved. 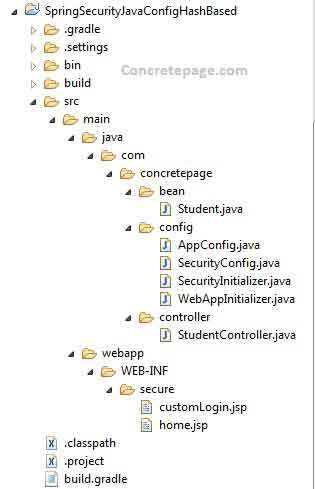 In remember-me configuration, we need to configure datasource while using XML and PersistentTokenRepository class while using JavaConfig. Here we have created a HTML checkbox. The name attribute of it is specified in remember-me configuration. After successful login, it goes to a secure page given below. Find the JavaConfig for hash-based token approach. Look at the below code snippet. rememberMe(): It returns RememberMeConfigurer class using which remember-me configuration is done. key(): It specifies the key to identify tokens. rememberMeParameter(): It specifies the name attribute which we use to create HTML checkbox. rememberMeCookieName(): It specifies the cookie name stored in the browser. tokenValiditySeconds(): Specifies the time in seconds after which is token is expired. 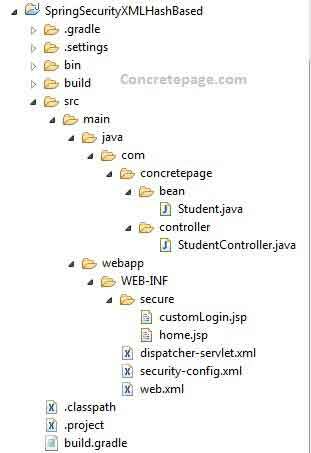 Now find the print screen of project structure in eclipse. Find the XML configuration for hash-based token approach. remember-me: XML security tag to configure remember-me. key: It defines a key to identify cookie. remember-me-parameter : Defines the name attribute which is used to create HTML checkbox. remember-me-cookie : Defines the cookie name stored in browser. token-validity-seconds : Specifies the time in seconds after which is token is expired. In persistent token approach, we need to create a table with name persistent_logins as follows. Find the complete database used in our example. 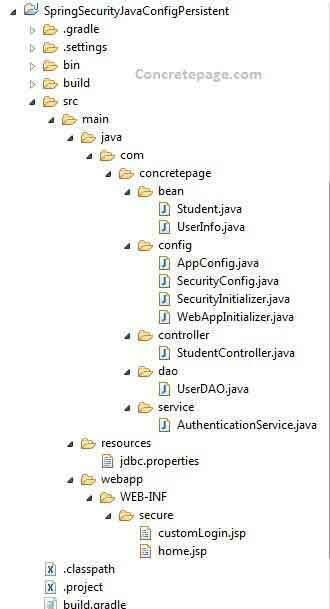 Find the JavaConfig to configure remember-me using persistent token approach . tokenRepository: It specifies PersistentTokenRepository which is used to query persistent_logins table. Find the XML configuration to configure remember-me using persistent token approach . authorities-by-username-query="SELECT username, authority FROM authorities WHERE username = ?" data-source-ref: Specifies datasource to query persistent_logins table. To run the application find the below steps. 1. Download the project source code. 2. Go to root directory of the project using command prompt. 4. We will get WAR file in build/lib directory. 5. Deploy WAR file in tomcat. Page will be redirected to login page. 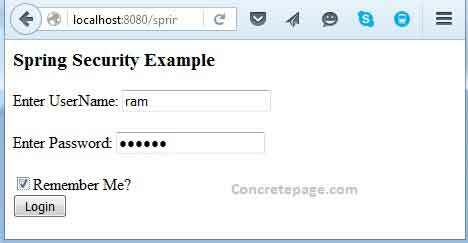 Select remember me checkbox and login using ram/ram123 authentication. It will go to a secure page. Check the cookies. There will be two cookies related to our web application that are JSESSIONID and my-remember-me as given below. Now to test remember-me, just delete JSESSIONID cookie. After deleting this cookie, session is expired and also restart the server. Now access the URL http://localhost:8080/spring-security-1/app/secure/home again. This time it will not be redirected to login page. This is because of my-remember-me cookie using which application will automatically authenticate user. In case we are using persistent token approach, a row for token will be inserted in persistent_logins table. After logout, token will be deleted. Now I am done. Happy spring security learning!